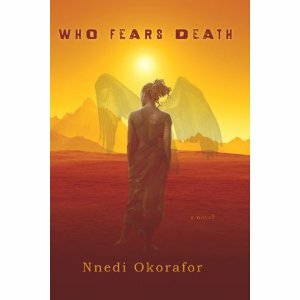 Who Fears Death?, by Nnedi Okorafor. Published June 1, 2010. DAW. Hardcover. 304 pg. My life fell apart when I was sixteen. Papa died. Thus begins Who Fears Death? an ingenious novel which ventures into a post apocalyptic Africa through the maturation and daring journey of a young sorceress named Onyesonwu. Her name means who fears death. Onyesonwu is an Ewu. Most look upon her with disgust and avoid her as much as possible. She’s an outcast. Her Okeke mother got brutally raped by a Nuru man. She named her Onyesonwu because she knew that her daughter would change the world one day and how could anything get worse than what she’d already been through. . Author Nnedi Okorafor stresses that Ewu are “children of violence.” Onyesonwu and her mother settle in Jwahir where her mother eventually marries the revered local blacksmith. He’s a magnanimous gentleman who sees beyond the surface to individuality and inner beauty. Who Fears Death? provides a genuine reflection on race and gender. Both her strong-willed mother and generous, open-minded father allow Onyesonwu to express herself and make her own decisions. As an Ewu, Onyesonwu doesn’t make friends that easily at school until she makes a major decision against her mother’s wishes. She participates in an 11th Rite celebration. Author Okorafor provides a plethora of details about genital mutilation, its aftermath for young girls and why certain people continue the barbaric practice. The only positive for Onyesonwu is that she and the other girls going through the rite are forever bonded and Onyesonwu has lifelong friends afterward. She also meets an Ewu boy and falls in love. After her father dies, Onyesonwu finds out that she has special powers which she could perhaps utilize to bring about peace and change to various parts of Africa. She shape shifts into different animals. She has amazing ability in her touch. She must fight to be trained properly because no one wants to train a woman. Through careful training, she learns to harness her skills and use them to protect the Okeke people and Onyesonwu is a sorcerer. Who Fears Death? blends magic with the intensity of the human spirit. Africa, Nnedi Okorafor, post apocalyptic, Who Fears Death? 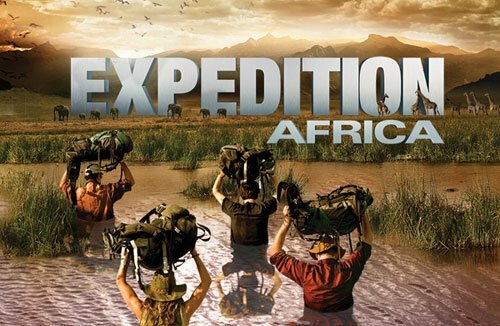 Expedition Africa, executive produced by Survivor’s Mark Burnett and Maria Baltazzi [“It’s like Survivor on the road,” said Mireya Mayor], brings together four explorers to follow Henry Stanley’s route. They use only basic maps and simple compasses. The foursome face similar elements as Stanley and Livingstone did over a century ago, despite some modernization of Africa. The terrain in Tanzania includes swamps, barren deserts, and treacherous mountains. Along the route they will be in danger from dehydration, potential injuries, poisonous snakes, fierce animals, infections, and deadly diseases. 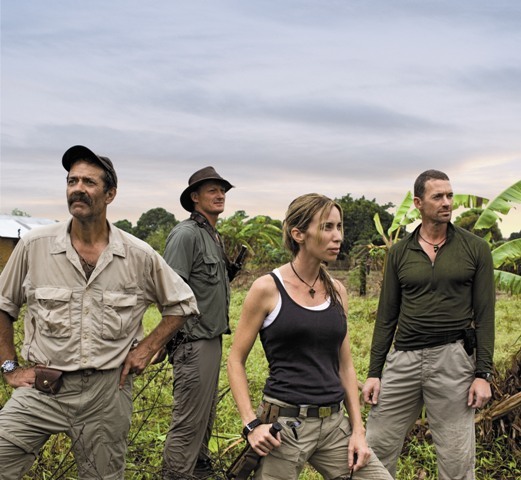 The explorers include: navigator Pasquale Scaturro, survivalist Benedict Allen, reporter Kevin Sites, and wildlife expert Mireya Mayor, PhD. Mireya Mayor holds a PhD in anthropology from Stony Brook University. She is a Fulbright scholar, National Science Foundation Fellow and former NFL cheerleader for the Miami Dolphins. She worked as a reporter on wildlife and habitat issues for the Ultimate Explorer series on National Geographic Television and has appeared on the Today show, MSNBC and CNN. 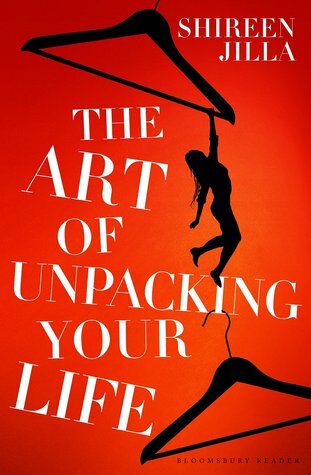 Additionally she has been profiled in People, Elle, Marie Claire, Latina, and National Geographic Adventure. Currently, Mayor stays quite busy with her work as an anthropologist: she lectures at schools and universities; researches in the rain forests of Madagascar [she discovered a new species of mouse lemur—the smallest primate in the world– in Madagascar]; and travels the world as a wildlife correspondent. I spoke by phone with the sweet and enthusiastic Dr. Mireya Mayor a few days ago. Amy Steele: [AS] How did you get involved with Expedition Africa? Mireya Mayor: [MM] I’ve been leading scientific expeditions and doing my scientific research for more than 10 years when they were looking for people for this show. Mark Burnett and Maria Baltazzi were basically looking for people who were the real deal. They wanted people who had a significant amount of exploration under their belt and could handle these situations and fend for themselves because at no point at all were we to have any contact with the crew. They couldn’t talk to us. We couldn’t talk to them. So they needed to know that in life-threatening situations, we would know what to do. They’d seen some of my work from previous documentaries that I’d done. 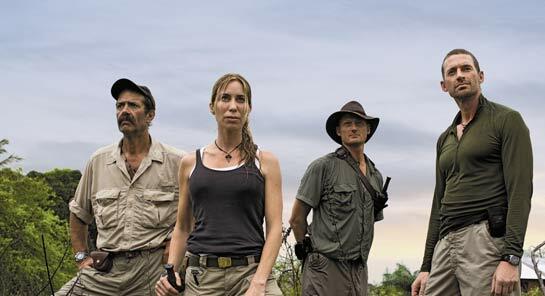 I was the first female wildlife correspondent on National Geographic, on a show called Ultimate Explorer and I went through a pretty heavy interview process. I think they had the hardest time selecting the right female because I think it’s a tricky situation with these three extremely tough guys and after that they just said are you interested and I jumped at it. AS: Why do you like nature, outdoors, and exploration? MM: I think it’s in my blood. When I’m out there I feel totally in my element and I feed off the beauty of nature and the challenge of nature and it’s just a natural curiosity that I’ve had probably since I was little. I was always fascinated by wildlife and the outdoors. Funny enough, I had never been camping before I set off on my first major expedition because my mom thought joining the Girl Scouts was far too dangerous when I was a little kid. But I’d always spent so much time outdoors and taking care of animals. So when I took an anthropology class as an undergraduate at the University of Miami, I was just fascinated with primates, in particular, and that there was so much we didn’t know about animals that were on the verge of extinction. [With] some of these animals that I went off to study, I was the first foreigner that these villagers had ever seen and there were only line drawings of animals available. We knew nothing. They were on the critically endangered list so the conservation aspect appealed to me so much. I thought one day I’d love to be able to share these amazing places, and people, and animals with my kids but we can’t do that if we don’t make an effort in raising awareness in trying to protect this very fragile planet. So that was my big motivation. I really wanted to make a difference when I came into these places and television just sort of crept into my life. I had no intention of getting into TV. I was purely a scientist but I also saw it as a great platform to raise awareness as to what was going on in these remote hidden corners of the world. AS: How can you get girls interested in science? MM: I do a lot of things at lectures, colleges, and sometimes all-girls schools and they’re always surprised to hear my background. I wasn’t very good at science or math when I was in school. I was an NFL cheerleader for the Miami Dolphins. It’s not your typical scientist route. And I think there’s a big connection and relief with young girls when they hear that. It makes them aware that they can do anything. We don’t have to look or act or be a certain way to be a scientist. Scientists don’t just come in geeky lab coats. We can be cool and we can still do good science. I led a real girly life before I got into this and continue to do so. AS: So you have a PhD in anthropology? Is it general or specialized? MM: It is physical anthropology. But I would completely immerse myself in these places and was intrigued by cultural anthropology and just became part of the family in these villages. I love learning about the local culture and their vast knowledge of these areas. Even with the Masai warriors on Expedition Africa, how much we were able to learn from them was just astounding. We would walk into a jungle and we’d see trees and they were seeing a medicine cabinet: the usage of every particular plant and its side effects and the dosage and it was just amazing to me to watch them flow through these terrains so gracefully. You’ll notice throughout these episodes that they look remarkably clean and impeccable and they didn’t even have a change of clothing for weeks. And here we were stumbling through and looking a right mess and dirty. AS: How did being a woman affect your role/position with the others on Expedition Africa? MM: I’m used to being the only woman on an expedition so perhaps I’m a bit jaded about it. In the beginning, Pasquale was a bit sexist towards me which I had not encountered in the past, so I was quite frustrated with him in the beginning. But the funny thing was that there was an evolution of all of us as we went on. Towards the middle, Pasquale was the one who was doing all my laundry and fetching me tea. And that’s where I think skill and experience come in, once he saw I wasn’t the token chick on this expedition. I had as much credential and experience as everyone else. And Pasquale and I are great friends now! Initially since I was more soft spoken than the guys, I was calling a lot of the big shots because they were turning to me to settle their arguments. It was a different style of leading. I wasn’t an in-your-face leader, but I was sort of pulling the strings. I think I was able to do that because I’m a woman. It was a very interesting dynamic going on because of that. The guys were not threatened by me as they were threatened by each other. They let their guards down with me, so I could really get at what the core issue was and I could steer them in the direction that I thought was best for the team. AS: Where did you get the water from? MM: Salt water is completely undrinkable whether you boil it or not. Other times when we thought we were collecting safe water, we’d have an entire stampede of animals through it, bathing and defecating in it. Parasites were a huge issue and you can only boil so much of that out. And at times it was just dry and barren and there was nowhere to collect water from. Even when we would arrive at a village and you would think, “How else could you sustain a village?” We’d go to the well and it would be completely dried up. Water was a huge huge issue which I don’t think any of us anticipated. We do pay attention to modern Africa and the plights on a day to day basis. AS: What was your greatest challenge out there (besides the water)? MM: Each other: all the conflict between us. The terrain: being constantly on the move between all these different types of terrain and not getting a moment to even acclimatize and rest. And then the wildlife. 29 very dangerous and poisonous snakes in Tanzania, most of which there is no antivenin for. So if you have the misfortune of getting bitten by one, your chances are not good because you generally only have a couple of hours to live. Hippos and buffalos are responsible for more deaths than any other animals out there. We were there during the nesting season of crocodiles which is when they are most aggressive and territorial because they are protecting their young. And then the mosquitoes. The malaria. One of us got malaria. And really almost didn’t survive it. It was cerebral malaria, which is the deadly form and we had to come to some very difficult decisions as to continue as a group of four or leave this person behind and continue on as a group of three. You’re still a team and you don’t feel you’ve accomplished your mission if you don’t arrive at your destination without the full team. AS: What was the most rewarding aspect of being a part of Expedition Africa? MM: Just being able to walk in the footsteps of two of the most important and famous explorers of all time. Being able to immerse ourselves in as close a way as you possibly could as they did, given there’s more than 100 years difference. And Africa has changed. There’s towns popping up here and there and real roads where there weren’t before but the essence—the dangers, the terrain, those remain unchanged– and it was just amazing to be able to go through this landscape especially with such an A-crew of team members. We all learned a lot from one another and working with Mark Burnett has been a joy. He has been so enthusiastic and passionate about the project and put his best crew members out there. The whole experience was just life changing. It was amazing to me. AS: I know the rainforest conservation work you do in Madagascar is very important to you. MM: Yes, I want to raise as much awareness as possible to the plight of these wonderful places disappearing. Madagascar is renowned for its biodiversity and its forests are disappearing and its animals are disappearing. So the most important type of conservation work is for me what I call “Muddy Boots.” And that’s being on the ground and being present and doing the work, not managing from afar and that’s where my passion lies. Not only getting to explore these places, I think I have a certain responsibility to protect and also to document it so it’s not just me having this information but it’s being shared with as many people as possible.